One nail polish finish I miss terribly is glass fleck glitters. These have very light reflective glitter particles that make your nail polish look sun-kissed. I'd say the best examples of these are the China Glaze Summer Days collection in 2009 and the Zoya Sparkle collection in 2010. I guess Zoya's most recent Bubbly collection does revisit the glass fleck glitter a bit, but it's not quite what I was wanting. Summer is all about neons, but I miss my sparkle. I came across some glass fleck glitter bomb indie nail polishes by Krafty Gurl Designs, and knew I had found something I had been craving. I have the color Orchid to share with you today. 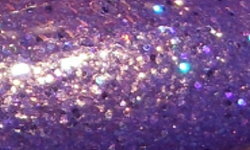 Orchid is a mix of lavender micro glass-fleck flake glitter, lavender mciro hex glitter, and micro lavender hex glitters. Color: Stunning. This is a beautifully saturated lavender that just glows when light touches it . Gorgeous. Formula: This doesn't have the sheer color/jelly element older glass fleck glitter polishes have since this polish is all glitter. I don't mind, it is amazing. This is a full coverage glitter. I used 3 coats above. The formula is a tad on the thicker side, but that did not interfere with application. Price: This is $7 on Krafty Gurl Design's website. Overall: This polish is a stunner! I haven't seen polishes with this type of finish in awhile, and they definitely need to make a comeback. I'm going to call this one a must have! There are also 4 other colors in this line that have the same type of finish. Awesome color. Good formula. Win. That is such a pretty purple! Yes! This one is stunning! Omg, this is stunning! Must have now! Stunning! At first I was bummed when Radiant Orchid was named the color of the year, but I am seriously loving all these orchid shades of polish! Sun-kissed nail polish, that's a great description Steph :)!